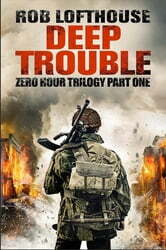 Written by a retired British soldier, Deep Trouble is the first in a trilogy of novels telling the breathless, vivid story of one young recruit's experience of one of the greatest military invasions ever launched. 6 June 1944 - Somewhere over the Normandy coastline, Robbie Stokes sits in a glider, his Bren resting on the floor between his outstretched legs. The nose lowers and the glider descends rapidly: ten minutes of stomach-churning twists and turns until suddenly the call goes up to 'BRACE'. The belly makes contact with the ground and the first Allied troops tumble out into occupied Europe. For Robbie Stokes it is the beginning of 72 hours of brutal and relentless conflict: a test of character, a test of nerve, a test of comradeship, of the band of brothers around him. If they fail, then the Allied invasion fails. They must succeed on their longest day. The operation to Pegasus Bridge is one of the most famous of the Second World War. Taking place six hours before the famous Normandy landings, when six gliders deposited the 2nd Battalion, Oxford and Bucks Light Infantry behind enemy lines with the orders to take and hold the bridges at Bénouville and Ranville. Part of this work has been previously published under the title, Well Past Trouble.